I give it an B-. A little better than I thought it would be. There were alot of characters in the Thor movie. So many that they give me my best list for pros and cons. He looked like Thor from the comics. A big blonde scandinavian too. Thor looked young, but then sometimes he looked older. His voice was kinda off. The actor is from Australia. But his actions were like Thor: bold and brave, a leader (convincing the Warriors Three to follow him) and he was polite and godly when he had to be. However, sacrificing himself near the movie's end was out of character. Even in mortal form, Thor would fight to his last breathe. The head SHIELD agent was as good as ever. No BS, straight to the point. Their humor was great too, "We got Xena, Jackie Chan, and Robin Hood entering the area." 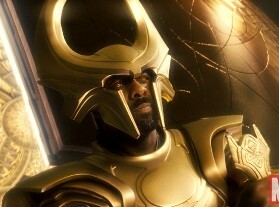 I like the multi-cultural nature of Asgard. And Asgard was big and beautiful, but where was the talk of Ragnarok (doomsday)? Asgardians were constantly complaining about it. Anthony Hopkins was a regal and wise Odin but he was not physically impossing enough. 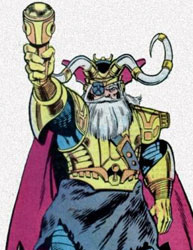 The Odin of the comics looked like he weighed 450 lbs. The credits mentioned his ravens, but I didn't see any. The movie has Odin losing his eye in combat, but the comics were more dramatic. Odin pulled out his own eye to see into a phophecy. I did like how he whispered and magically imbued Monjur (Thor's hammer). But I didn't like how he "cast out" Thor; too religious. She was beautiful and all, but in the comics she was always a Thor love-interest, not just a friend. In the movie it was all about Jane Foster. And the comic's Sif could be a stand-alone character; going out on missions at Odin's request, or teaming up with Thor or Balder on ocassion. But in the movie, she seemed too much like "just one of the guys." The movie missed his essence completely. First, they made the too-common movie mistake of giving us only a "reluctant villain." He's not evil, he's misunderstood. Loki wasn't even really a bad guy, let alone, evil like he should be. Smuggling in the frost giants was a prank, didn't kill Hemidall, stopped Odin from being murdered. Sure, he tried to destroy the Frost Giant world, but those giants are the enemies of Asgard. In the comics, Loki was rotten to the core. He wanted Thor dead and Asgard destroyed. And Loki and Thor never battled. Loki knew he was out-matched and looked down his long, crooked nose at physical combat. More times than I can count, Loki of the comics would trick someone else into fighting Thor, like Hulk, Silver Surfer, Hercules, everyone. Loki is a schemer and he always got the blame deflected too. He rarely took the rap. Loki would never let let himself fall into the void. Nothing like the comic book Jane, who was timid and obedient. Natalie Portman was too much like Jody Foster in Contact. And there was not enough to her character. Her only emotion was curiosity. She didn't seem that amazed by Thor (she let him walk away) nor did she seem heartbroken when SHIELD took her life's work. 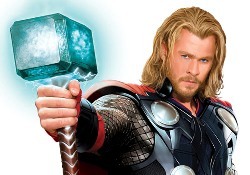 Portman did too many movies in 2011 and only gave Thor half an effort. I liked his look and voice and multi-culturalness, but he sucked as Hemidall. Hemidall is supposed to stop enemies from entering Asgard but not control which Asgardians leave. And he was not very loyal nor obedient. 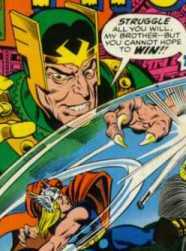 He let Thor and others go to the Frost Giant realm, he let the Warriors Three go to Earth, and he attacked Loki when he was his king. And with the rainbow bridge broken, he's now out of a job. The Destroyer is supposed to be magical armor. An empty shell, nothing more. Not a robot. It has to be animated with the soul/spirit of another. And I didn't like it being a main villain. Thor has lots of villains, just pick one. Too many Asgardians fighting each other. It was like the X-Men movies: mutants only fight other mutants. Not fat enough, not cowardly enough. The comic's Volstag has character. The movie Volstag blended in too much with the other Warriors Three. Where was he? Was he late for rehearsal. Odin: "Thor, you learned alot from your short visit on Earth. You should spend more time there." Thor: "But the rainbow bridge is destroyed." Odin: "Any bridge that can be broken, can be mended."